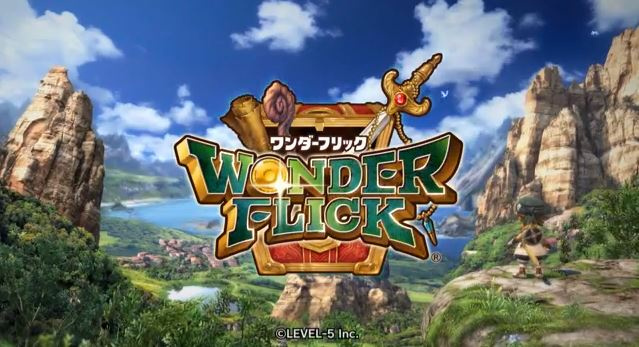 During Level-5's Vision event today in Japan, the company behind the popular Professor Layton series announced it has a new game in development: Wonder Flick. The title will be a touch-centred RPG and is set for release on the Wii U in Japan in 2014. It will also release on other platforms such as PlayStation 4, PlayStation 3, PlayStation Vita, Xbox One, iOS and Android, though the touch mechanics will incorporate smartphones and tablets with the system in the case of the Sony and Microsoft platforms. There's quite the talented bunch behind Level-5's upcoming adventure; CEO of the company Akihiro Hino is directing the game, Nobuo Uematsu is the mastermind behind the music, character designs are done by Nao Ikeda, while boss character designs are led by Takuzō Nagano. A featured system called 'UniPlay' will be available, which will allow cross-platform saving. Check out the game's trailer below, and let us know what you think in the comment section below. Why does this look so much like dragon quest? It's coming to everything but 3DS I wonder why. Still looks quite interesting might get it on WIi U or Vita. Hopefully it will come to the Wii U in NA and EU. cross-platform saving? why cant they do that with other games? "It will also release on other platforms such as PlayStation 4, PlayStation 3, PlayStation Vita, Xbox One, iOS and Android, though the touch mechanics will incorporate smartphones and tablets with the system in the case of the Sony and Microsoft platforms." Not very interested in the game for now, but I'm curious to see what it will work on home consoles, as this seems very much designed for iOS from the ground up. This looks interesting, although I'm not so sure about the "touch-based" part. Bummer that it isn't an exclusive, but it looks like it will play much better on the Wii U anyway. Hopefully this comes to the West. That looked great... until the gameplay I'll keep an eye out for it, but don't have high hopes. @retro_player_22 How does that ruin it? More platforms means more people get to play it. True but it being released on other platforms means there's no point in getting this for any of them if you already had an android iOS or PS3. Chances are more people will probably be getting this for iOS because of it being cheaper. Would had being something special if it's a console exclusive. I'd certainly buy it on my Wii U! Also, it's coming to the Xbox One and Vita but not the 3DS? Wut?! Hm, play the game on my Wii U at home, and then continue the adventure on Android with the UniPlay system? Seems pretty cool. I'm hoping it takes advantage of 2013's high end chipsets like Tegra 4 and Snapdragon 800 and 2014's like Tegra 5. Home consoles will probably have those graphics in-game, while mobile devices will vary. Vita and high-end 2013 smart devices should get close to that, and 2014 high-end smart devices should look the same as the PS3 version. I lost all intrest once the gameplay started. It's completley unappealing to me. Comparing the size of that dragon's head and the shield, I'm surpised the little guy survived. I was excited til I saw it was basically a touch screen RPG. I'll pass. Great music from Uematsu though!! An RPG with music from Uematsu coming to Wii U? That alone is enough to get this on my radar! Ah yes, that caption. 'Flick em' up!' Okay makes offensive gesture is that what the game's about? pricing will determine whether or not I get it. I despise gaming on my android as I have yet to see it as a viable option when it comes to control and overall quality, but for a game that's essentially built around mobile/tablet and the high cost of developing for a console, with no eshop release on the 3ds???? ?, most likely bringing a higher price... no thanks. cute idea tho. It looks interesting but I'm not sure I see a lot of depth here. It looks like it'd be better served on a smartphone, seeing as that's what is shown in the trailer. It looks interesting, But i wonder if theres gonna be any real gameplay differences between the mobile devices and the consoles. If not, Then thats fine too. The battle system looks pretty good too. Wow, a new Uematsu soundtrack! And the touchscreen controlled RPG gameplay is something new and looks kinda fun, at least on Wii U and other touch devices. But the graphics aren't that great (are the shots from the tablet version? ), the standard anime style bores me a little. Layton and Inazuma had fantastic character art. Am I expecting too much from Level5 designers? It's probably too early to tell, but if this turns out to be good I consider getting the Wii U version. I was excited...until I saw that it's just a mobile phone game brought to Wii u! It looks still interesting though, like Dragon quest for the Wii but with more depht! Nope, really i am the only one having a problem with the art style? Dragon Quest and Ni No Kuni look mature compared to this, sigh. Thank goodness there's Xenoblade, i've put 300 hours in the first one that was limited because of the Wii cabilities so really i won't need a JRPG for long after X is out.